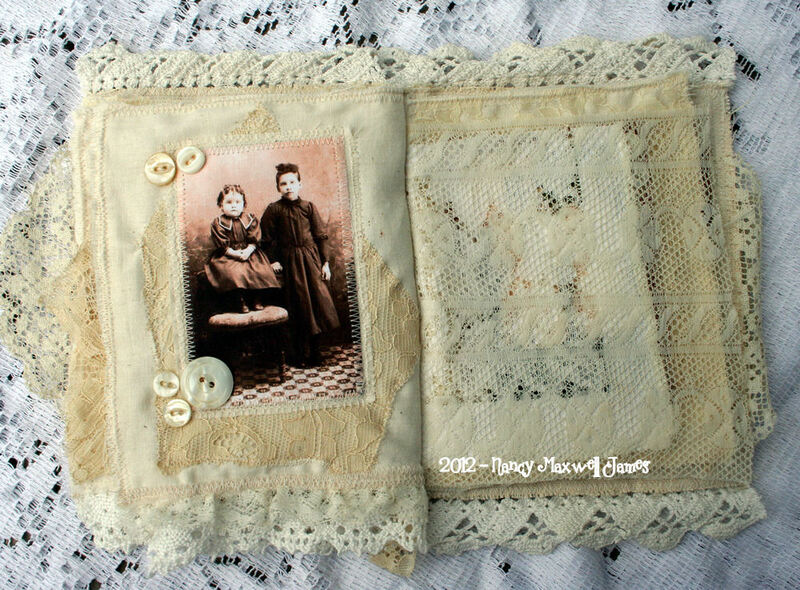 I made this fabric journal book using images from Digital Collage Sheets (the same as my tag post last week), but a few of the images are from my own personal collection of cabinet cards. 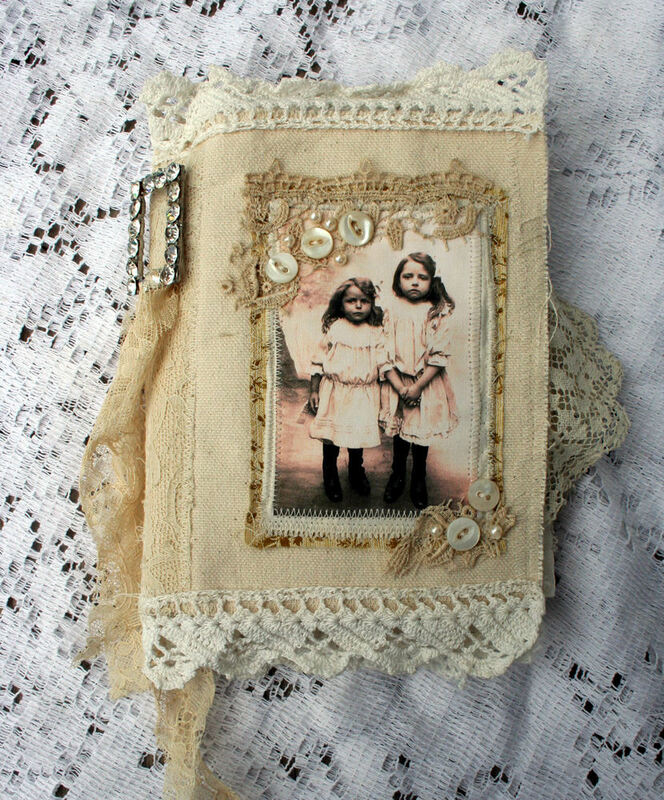 The theme for this journal is “Sisters” because each image has two girls. 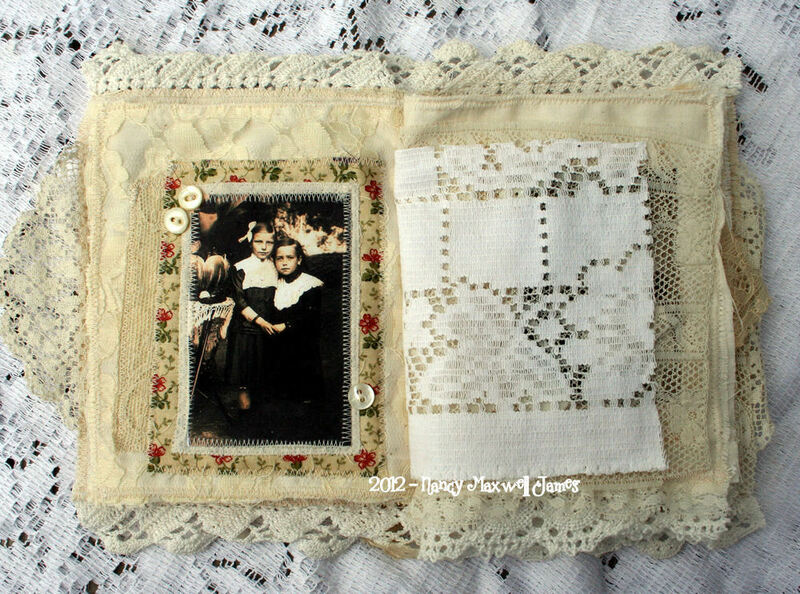 There is oodles of lace in this piece, pocket pages and a gorgeous vintage rhinestone brooch that adorns the cover. The temperatures have been heavenly here in Michigan the last few days. I had jeans and socks on just a few days ago. It feels like I haven’t done that since March! ;) Happy Monday to you! So very charming Nancy! I hear you on the heat..so ready for autumn this year! So sweet and delicate, Nancy! It has been over 100 degrees here for too long! I need a break from thsi heat! Enjoy the nice weather! Hugs! Oh what a sweet piece this is. I would have to do this with brother/sister! Not wearing long pants yet…still hitting around 92 for the last several days. It’s also very dreary with fires blowing smoke in this direction now. I think there was sunshine today!!! Nancy your book is a dream. Page by page. I love all the laces and images. 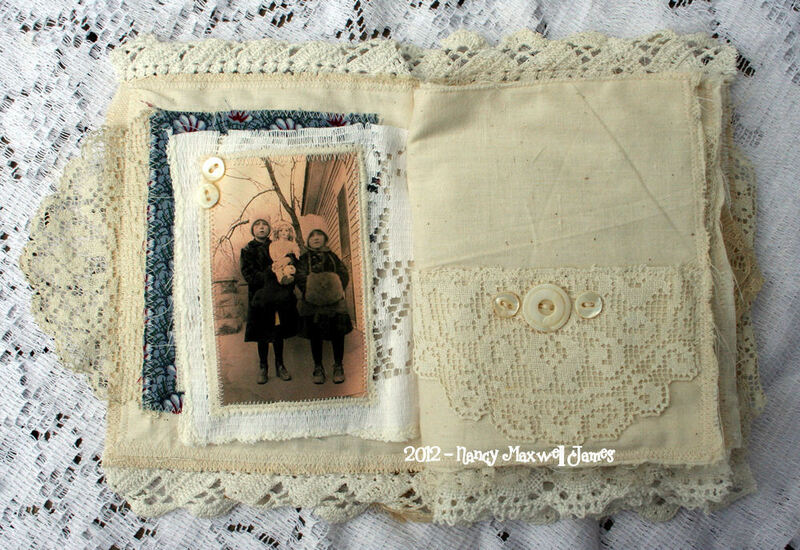 Nancy, This journal is just gorgeous! 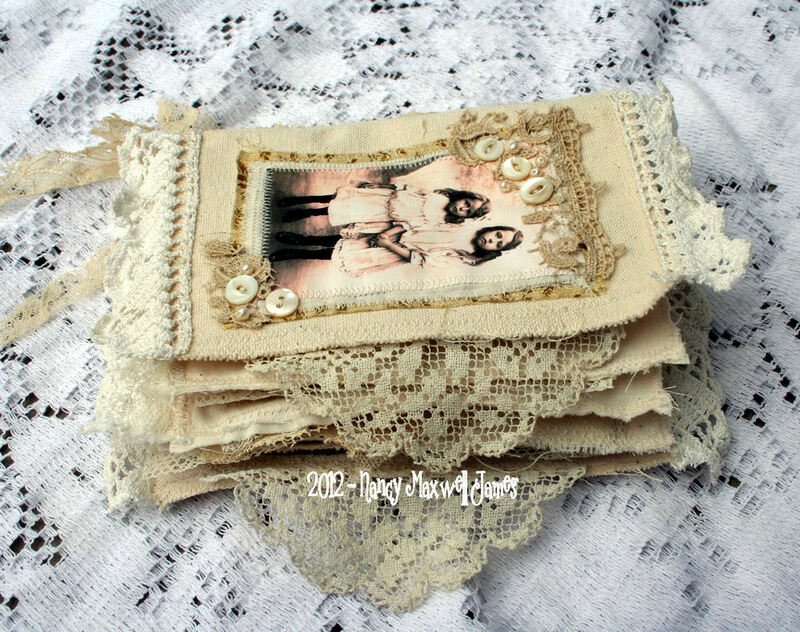 I love all the sweet images you’ve used and all the yummy laces and doilies. 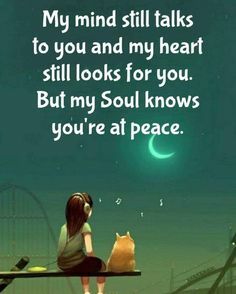 Hopefully your brother is doing well and you don’t have to worry so much. So scrumptious Nancy! 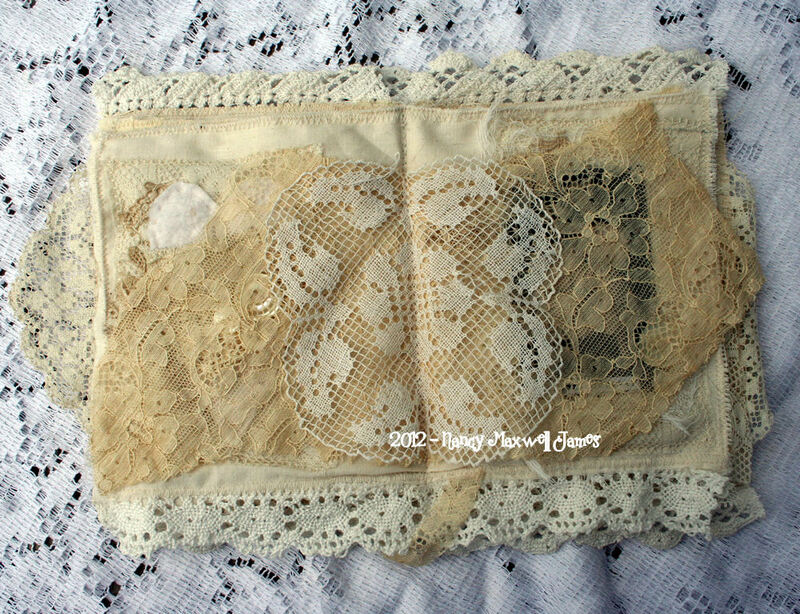 Where in the world do you find the continuous source of such wonderful lace? just catching up on you.Love. love your book.It is to die for. 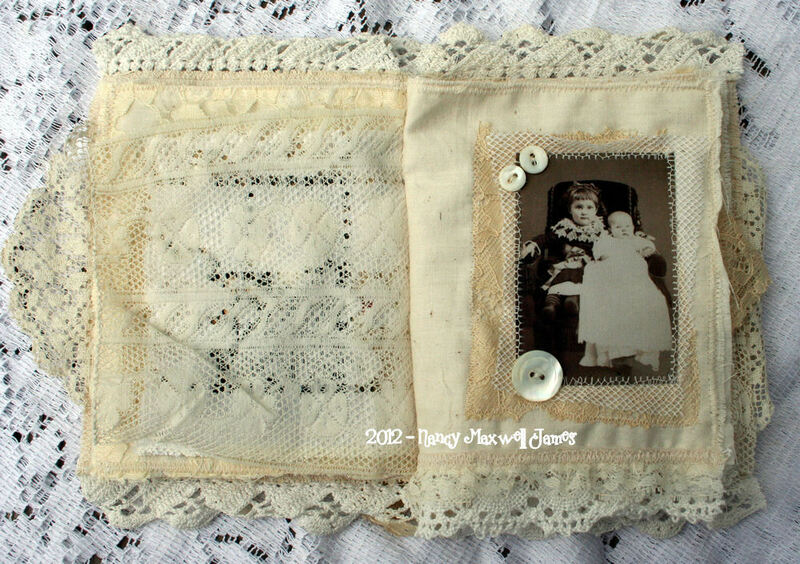 Nancy, I thought it was only the cover that was fabric so to see photograph after photograph with those images backed onto dreamy lace, oh my goodness, so special. 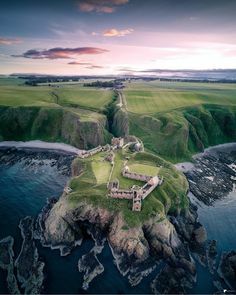 Have the most amazing time with your Scottish family when they visit in September :) We’ve had mixed weather here, in fact at the moment there is a thunder storm. 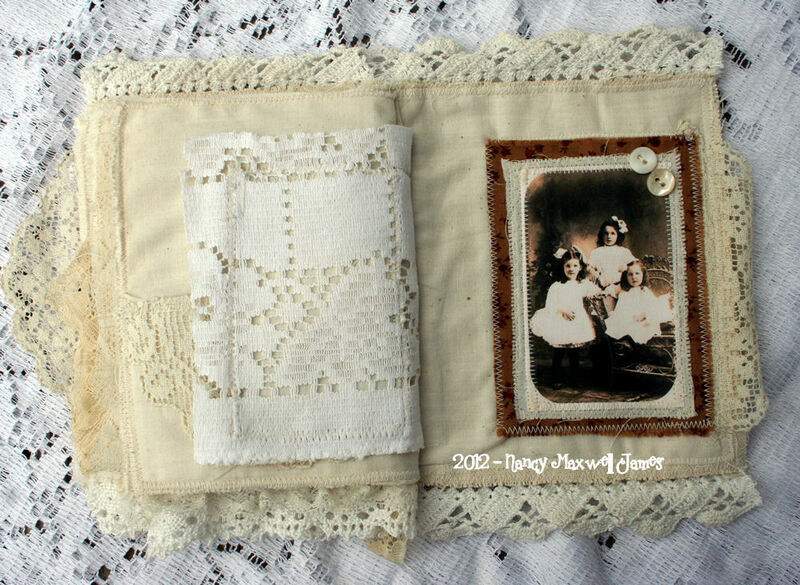 What a Gorgeous fabric book Nancy. Love all the lace. 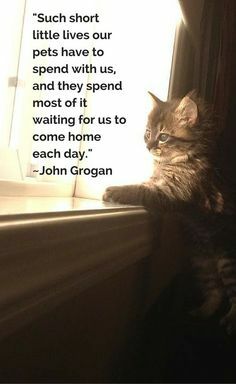 Its been far to long since I’ve been over,the daily grind of life just gets in the way sometimes. Doing some catching up now. 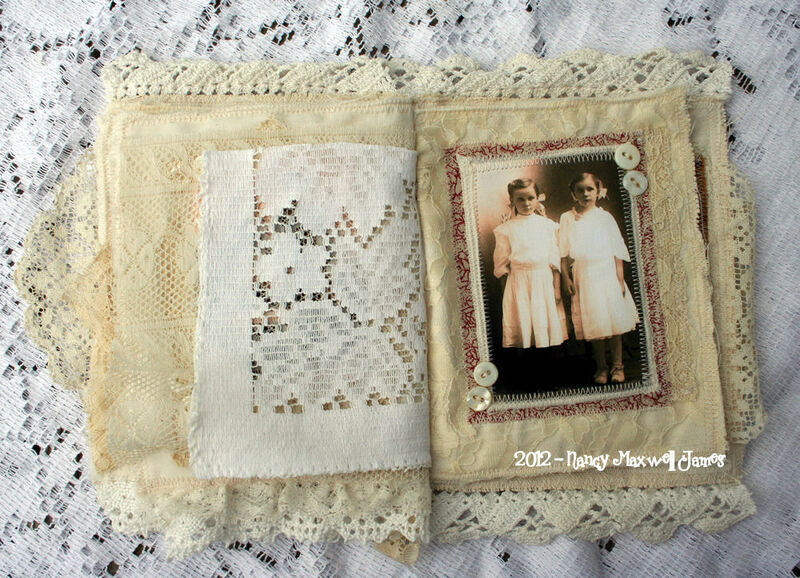 your sweet sisters all so beautiful, looks lovely with the old and new laces, and you made so many wonderful pages in this book. 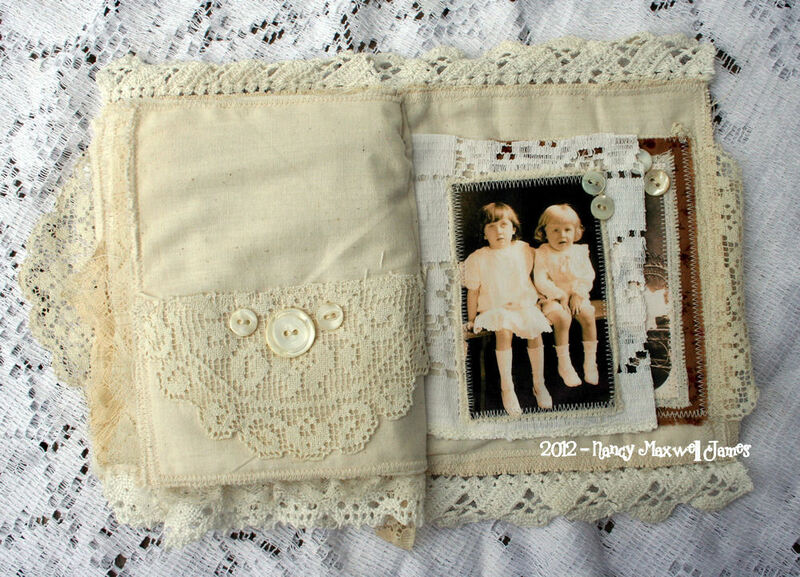 Love that all is fabric, also the images, and love your sweet addicion of buttons on each page. A gorgeous book to save little secrets inside. WOWOWOW what a heavenly art work! 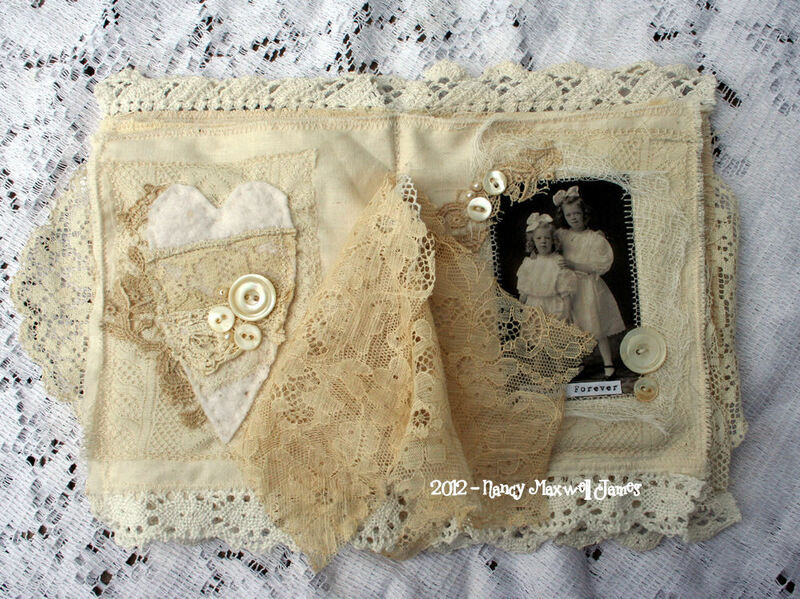 Each pge is so delightful I’m excited!Images , laces and buttons, everything fits together perfectly. 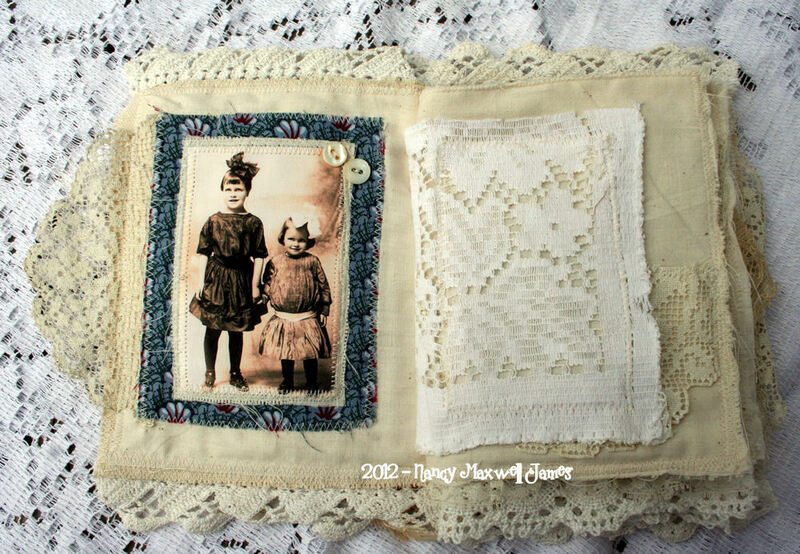 Nancy what a most exquisite little book of precious images and precious laces. I can see the enjoyment whilst you create this beautiful piece of art – it reflects the beauty within you! A feast for the eyes. This book looks fantastic!